As technology is ever changing, it is becoming more apparent that the new generation of personal computing is heading for a revolution. New devices are being introduced at a steady rate that advertize powerful computing power with the compact presentation of a smart phone or small tablet, like the iPad or Xoom. This presents the question: what is next for personal computing? Is it possible that desktop computers and laptop will be phased out soon to make way for these new devices to be used full time? Most American have already made part of the switch by relying so heavily on smart phones for their daily connections. Things like email that once required a wired connection can now be maintained on the go from anywhere service providers offer coverage. This debate is fascinating so we decided to do an experiment on our own personal computing needs. For our ethnography the two of us decided to compare our use of our computers and cell phones. Being two subscribers with smart phones, we planned to monitor our use of the two separate technologies over a two week period. The first week we recorded our use on our laptops as well as our phones. 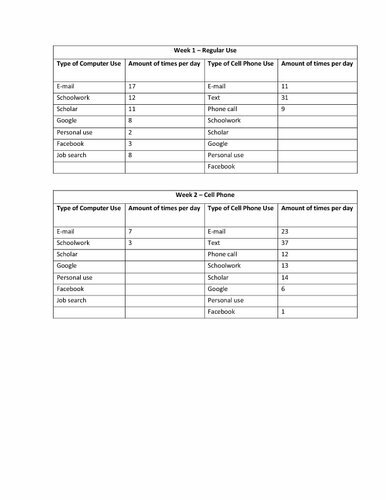 The second week, we have up our computers completely and attempted life exclusively though our cell phones. We developed a table on which to record our data on how often and for what reasons we visited each technology. These tables can be seen below with an average listing between our two sets of collected data. Before beginning our week computer free we both sat down and discussed our expectations for the experiment. We both agreed that we were nervous to give up our computers and though that there was no way either one of us could go a whole week without one – that they were too essential to our daily lives. There was a consensus that even though our phones were “capable” of completing tasks that we might need throughout the week – we were both doubtful of the validity of these statements as we had never utilized them. It was definitely going to be an interesting week and a learning experience; perhaps even a look into the future. To record our results, we have produced a list of questions and have answered them collectively as a team representing our overall experience with the experiment. Did you find it hard switching to just your cell phone? No. Since we have smart phones they can do basically everything our computers can. The only big difference is that when using a phone you are looking at a smaller screen. We were able to go on the Internet, receive and send e-mails, go on scholar, etc. Did you find yourself having to use your computer because your cell phone could not do something? In some cases, we did need to use the computer. During the computer free week, Laura was required to write a paper for class. Having to write a paper on a cell phone is possible, but would have taken more time to compose, so she used her computer. One problem that we both ran into as graduating seniors was the inability to access saved documents (resumes), attach them to emails, and send them to professors or potential employers. For this reason, there were brief occasions that we both had to log onto our computers to send these emails out. One thing that set the two of our weeks apart on an individual level is that Laura is enrolled in online classes, and that Carey is not. The following is Laura’s account on how she dealt with her online classes on the computer free week. Did you find yourself going on the Internet for social reasons less during the week you just used your cell phone? Laura: “I do not go on social networks (i.e. Facebook), aimlessly surf the Internet, go on the Internet for social reasons, etc. that often. That being said, I did go on Facebook/ social Internet less when I was just using my cell phone. Though I don’t go on social networks/surf the web often, I do believe I would have more if I was not just limited to my cell phone. I believe this because even though my cell phone is very fast, my computer is faster. If I am going to social networks/surfing the web I want the browsers to go as fast as possible. Since I know my cell phone isn’t as quick as my computer, though they are very close, I just don’t feel like bothering. Carey: “On the contrary, I think that when I was using my phone all week I found myself killing time here and there on social media sites. Just having the phone in my hand made me want to check up on what was happening around my social circles. I think that this is a reflection to the convince that programmers have made their “apps”. It takes 20 seconds to check my Facebook newsfeed. Why not check into it before I slide my phone back into my purse? Do you have a preference between using your computer or cell phone? We both agree that it all depends. Overall I like using both; it just depends on the situation and what needs to be done. If we have tasks like writing a decently long paper (5 pages or more) we would prefer to use our computers because it takes less time to type and it is easier to go through the paper because the screen is bigger so more fits on the screen. Overall we are all about what’s easier and quicker. Before this experiment neither one of us had considered how much we really use a computer and phone. Logging onto a computer to go on the Internet or checking e-mails on the phone is almost second nature, so to actually see the data of how much we use both technologies in one week is a big realization that we use them a lot more than we ever thought. This experiment also showed us that we couldn’t do everything on my cell phone because the technology is just not there yet. We thought that because we have such advanced phones that they can do everything that a computer can, but they really can’t, and even if it can do something we don’t feel as comfortable doing it on a cell phone as much as on a computer. One thing that we realized we couldn’t do on our cell phone is type a paper. Not only does it take much longer to type on a cell phone than on a computer, but also the cell phone does not have all of the functions (spell check, etc.) that Microsoft Word has on the computer. We also realized that we could not send attachments in e-mails through the cell phone, which created a problem for us because we are enrolled in classes and are constantly sending e-mails with attachments. Overall this experiment was informative because it not only showed exactly how much we use technology, but that certain technologies are not as advanced as we originally gave them credit for. We both agreed that one day we will all be able to give up our computers and just use cell phones or tablet devices with data plans. Cell phones are more convenient than computers because they are not only smaller, but they are more portable without sacrificing computing power. In some cases they are even better: they all advertize a battery life that is several times the length of a typical laptop battery. Though the technology in cell phones has come a long way, unfortunately they are not quite there yet, so until then it looks like we will have to switch back and forth from our cell phones and computers.